The forecast has looked awful all week. This is never a good thing when heading into the canyon lands. You may have gotten a sense of this when reading my last post, but for this excursion it was for an entirely different reason than the fear of a flash flood. Despite the forecast, I am joined by Grand Canyon explorer Rich Rudow into the remote western part of the Grand Canyon on an Arizona Republic/ azcentral.com reporting trip to visually document the hundreds of helicopter flights per day that leave from Las Vegas. They offer tourists a chance to fly into the canyon along the Colorado River and get back to the slot machines in a matter of hours. With the rain and wind however in the forecast would the Las Vegas tourists choose to see Penn and Teller instead? Would the tour operators even still fly? For me it’s a long way to travel to document what the activists are calling “Good Morning Vietnam” if all the helicopters are grounded. After a 10- hour drive, followed by an all day off trail hike, dropping nearly 5,000 vertical feet through multiple layers of geology I hear my first helicopter. Clouds fill the sky but the ground remains dry. We reach the river and set up camp. Helicopters buzz over head around every 15 minutes. Rich comments that the volume is down. He thinks because of the weather. Until now the skies have stayed dry but halfway through my chicken and dumplings Mountain House the weather begins. The rains come in heavy and quickly. We haven’t seen a helicopter in 20 minutes and I assume the popular sunset tours have been cancelled because of the storm. Just then I can hear the drone of rotors approaching. A pair fly directly over the river and land on the opposing bank a quarter mile upstream. As I’m being hammered by rain I shoot stills and video of the helicopters. Night begins to close in and the helicopters remain grounded. Red and white lights flashing on their tails can be made out through the thick atmosphere. “I think they’ve found themselves fucked out there,” Rich comments besides me. He elaborates, they are not supposed to be here after dark but the weather may be preventing them from getting out. The winds bring them good fortune and they die down slightly as do the rains. Just before full dark they take off and head back to the lights of Sin City. We retire to Rich’s tents and go horizontal. While sharing in the pleasant chit chat of adventures past I notice a warm glow illuminating the walls of the tent. I race outside to see the most amazing Grand Canyon sunset I’ve ever seen. The light show of the Fountains of Bellagio have got nothing on this. The following morning, less than an hour after sunrise the noise can be heard before they can be seen. Its a striking juxtaposition to this wild and remote place. Then they start coming one after another and that pristine essence is shattered. Rich and I spend the better part of the day walking along the river documenting chopper after chopper. Some claim it is the busiest helicopter corridor in the world. Though I can’t verify this it wouldn’t surprise me. Long after losing count on the actual number, Rich and I begin the long trek back to the rim. The following morning I have a rendezvous with friends for another nearby adventure. The rain didn’t stop the helicopters, but as you may already know it will stop this one, only creating a different one. Check out the story on azcentral.com. A helicopter flies over the Colorado River through the Hualapai Reservation and the adjacent western part of Grand Canyon National Park on March 23, 2017. 300-400 helicopters fly per day over the western part of Grand Canyon National Park. Grand Canyon explorer and activist Rich Rudow explores in a side canyon in the western part of Grand Canyon National Park on March 22, 2017. A Papillon Grand Canyon Helicopter flies over the Colorado River on the Hualapai Reservation and the western part of Grand Canyon National Park on March 23, 2017. 300-400 helicopters fly per day over the western part of Grand Canyon National Park. Two helicopters fly in inclement weather over the Colorado River on the Hualapai Reservation and the adjacent western part of Grand Canyon National Park on March 22, 2017. 300-400 helicopters fly per day over the western part of Grand Canyon National Park. The sun sets over the Colorado River in the western part of Grand Canyon National Park on March 22, 2017. Passengers get off a Papillon Grand Canyon Helicopter after flying to the western part of Grand Canyon National Park, at the airport in Boulder City, Nevada, on March 21, 2017. 300-400 helicopters fly per day over the western part of Grand Canyon National Park. Grand Canyon explorer and activist Rich Rudow watches a helicopter fly over the western part of Grand Canyon National Park on March 23, 2017. 300-400 helicopters fly per day over the western part of Grand Canyon National Park. A Papillon Grand Canyon Helicopter flies in the western part of Grand Canyon National Park as others sit on landing pad on the Hualapai Reservation on March 23, 2017. 300-400 helicopters fly per day over the western part of Grand Canyon National Park. Agave plants loom over the rim of the Grand Canyon in the western part of Grand Canyon National Park on March 22, 2017. As canyoneers we have wondered what it would be like to be in many of the canyons we explore in flood stage. Cody Howard is one of those people who has seen it first hand, having run first kayaking descents of Salome Jug, Christopher Creek, Upper Salome and others, during super high flows. With the 2016 winter being a predicted banner El Nino I was assigned for my job as an Arizona Republic staff photographer to shoot stills and video of Cody during his creek boating, aka creeking, aka steep creeking adventures around Arizona. I met Cody for the first time at his Scottsdale home so we could get to know each other and get some interview footage. The El Nino never left much of an imprint on Arizona and even after spending an entire day with Cody and his pals searching for white water in the Bradshaw Mountains of central Arizona, I was left with no footage. Fortunately, Cody had plenty of his own video from over the years and I was able to use his it to produce the above video. If you like the video, check out the amazing story “Up a Creek with a paddle: Desert kayakers chase the water” by Arizona Republic reporter Ron Dungan. Seven years in the sport. This year ventured into new canyons in familiar ground and went out to all together new territory. From Colorado Plateau skinnies to Class C gems to family outings in narrow places it was a wonderful year. Chris hikes on the approach to the South Fork of Alder Creek in the Mazatzal Mountains. Brian rappels in the South Fork of Alder Creek. Eric going high in Hog 3 in the North Wash Area. Eric and Mark work their way through the reeds in the main Hog drainage after completing Hog 3. Mike hikes towards Constrychnine in the Poison Springs complex with the Henry Mountains in the background. Chris, Brian and Mark cross the first pool in Woodchuck Canyon. A selfie in the West Fork of Leprechaun Canyon. David and Wyatt in Willow Springs Canyon in the Apache-Sitgreaves National Forest. Laura and Wyatt in Willow Springs Canyon. Mark rappels during Laura’s trip in Frye Mesa Canyon. Brian traverses during David’s trip in Frye Mesa Canyon. Katie swims during David’s trip in Frye Mesa Canyon. Wyatt clings to David to stay dry in Pine Creek in Tonto Natural Bridge State Park. Wyatt climbs through some narrows below the Tonto Natural Bridge. Eric in a beautiful hallway in Ice Cube Canyon in the Red Rock Canyon National Conservation Area. Also not living in Ice Cube Canyon. For some reason we decided to run the 2- miles to retrieve our car in triple digit temps. You can see Ice Cube Canyon (background left). Canyon of the Dammed in the Sierra Nevada Mountains. Chris getting air Lower Jump Canyon in the Sierra Nevada Mountains. Daisy in the “Rainbow Room” in Lower Jump Canyon. Chris and Scott in beautiful light in Lower Jump Canyon. Cody on the final jump of Lower Jump Canyon. A snakes stretches out and sticks out its tongue on a tree branch hanging over a pool in Upper Jump. Cody having fun in Upper Jump Canyon. Cody rappels through a three ribboned waterfall in Upper Jump Canyon. Mike’s head pops up after jumping into water in Upper Jump. Mark moves through a gorgeous boulder cave in Upper Jump Canyon. Laura rappels in the narrows of the Upper Right Fork in Zion National Park. Laura hikes along the bottom of a waterfall in the Right Fork. Chris rappels as David looks over Double Falls in the Right Fork. It should be called Quadruple Falls. The Vermillion Cliffs are aglow in the last of the days light as seen during the drive home. Chris moves through the short narrows of Pick Axe Canyon. Chris pack rafting on Canyon Lake. Eric and Chris look off the rim of the Grand Canyon above the Eminence Break above Tatahoysa Wash. Steam rises from Chris’ rappel device after touching it with his sweaty glove at the bottom of a 150 foot rappel in Tatahoysa Wash.
Chris and Eric are silhouetted against the red wall in Tatahoysa Wash in the Grand Canyon. As professional photographers Laura and I are both used to seeing our images published in print. From the pages of the New York Times to the Arizona Republic to USA Today our photojournalism and portraiture is printed on a regular basis. Our canyoneering photography has always been more of just a weekend warrior labor of love, so when we get these images published its kind of exciting. 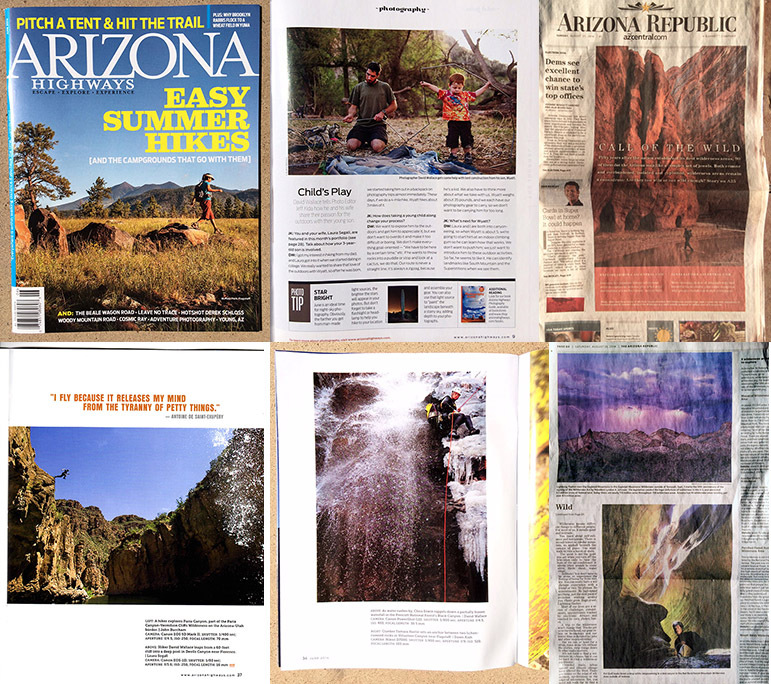 In the last four months we have had quite a few of these photographs published in various publications, including Arizona Highways, Red Bulletin magazine, Phoenix Magazine and the Arizona Republic. Check out the slideshow and in the captions you will be able to link to the trips these images came from. One footnote, the story in the Arizona Republic was about the 50- year anniversary of the signing of the Wilderness Act. Arizona alone has 90 wilderness areas at over 4.5 million acres. Arizona Republic reporter Ron Dungan and I explored what lead to the United States becoming perhaps the first nation to designate land to preserve it solely for its wild character. We also looked at the conundrums of wilderness today and why wilderness is important for future generations. To read Ron’s story, a video I produced on four perspectives of people deeply connected to wilderness and a slideshow of my images highlighting Arizona’s magnificent wilderness click here. The cover of the June 2014 of Arizona Highways. Inside we had three photos published. The May 2014 issue of Red Bulletin magazine. Inside David had a photo published. The June 2014 issue of Phoenix Magazine. Inside David had a photo published. Another year. Six years now actually that I’ve been lucky enough to partake in this sport and the amazing places that it allows one to witness and experience. Along the way some new partnerships and friendships have been forged. Highlights included: a multi-day trip into the tight slots of Ticaboo Mesa near Lake Powell. An overnight backpack with Laura and my son, Wyatt, in Aravaipa Canyon. An all business four day trek through some of the best technical slots of the Grand Canyon. Getting to share with Laura one of my favorite descents in Kolob Canyon in Zion National Park. And a 45- mile paddle filled with fun and relaxation down the Green River through Labyrinth Canyon. The year ended right with back to back cold, watery descents in the final two weekends of the year in the Mazatzal Mountains. Before leaving for the final trip, Wyatt, now three asked me, “You going canyoneering? I want to go too.” Another year. Here is a look back. Waterfall during solo descent in Headdress Canyon in the Superstition Mountains. Adam stems in Good Day Jim canyon in the Glen Canyon National Recreation Area. Mike wades a pool in the sun in Good Day Jim. David stems high in Limbo Canyon in the Glen Canyon National Recreation Area. The crew drops into Purgatory Canyon in the Glen Canyon National Recreation Area. Brian looks back midway through a two stage drop Purgatory Canyon. Eric raps in Purgatory Canyon. Adam is seen on a sandstone ridgeline in front of Lake Powell on the approach to Paradiso Canyon in Glen Canyon National Recreation Area. Mike crawls to squeeze through a narrow section of Paradiso Canyon. Only time, wind and water could sculpt this in Paradiso Canyon. David bridges over a pothole in Paradiso Canyon. Eric wades in Hard Day Harvey in Glen Canyon National Recreation Area. Brian wades in Hard Day Harvey in Glen Canyon National Recreation Area. Laura and Wyatt take a break in Aravaipa Canyon. David and Wyatt explore Deer Creek Canyon, a side canyon of Aravaipa Canyon. Wyatt feels the dripping water of a spring in Deer Creek Canyon. Wyatt hikes in Aravaipa Canyon. David and Wyatt set up the tent in Aravaipa Canyon. David and Wyatt hang out by the campfire in Aravaipa Canyon. Laura and Wyatt, the morning after not the best night’s sleep in Aravaipa Canyon. A Gila Monster in Aravaipa Canyon. Canyon frogs mate in Little LO Canyon in the Coconino National Forest. The upper reaches of 150-Mile Canyon in Grand Canyon National Park. Cody wades a pool in the gorgeous Redwall in 150-Mile Canyon..
Mark walks along a big horn sheep trail above the Colorado River in Grand Canyon National Park. Eric explores the Muav Limestone narrows of lower Matkatamiba Canyon in Grand Canyon National Park. Mark takes in Panameta Canyon in in Grand Canyon National Park..
Cody and Eric hike along the rim above Matkatamiba Canyon in Grand Canyon National Park. Mark and Cody soak in the last of the sun after a 13- hour day in camp at the head of Panameta Canyon. Eric climbs up the Sinyala Fault in Grand Canyon National Park. Eric raps down the 100- foot drop into the Redwall narrows into Olo Canyon in Grand Canyon National Park. Cody in the Temple Butte in Olo Canyon. Eric, Mark and Cody traverse a ledge in the Temple Butte narrows in Olo Canyon. Mark floats in a packraft down the Colorado River in Grand Canyon National Park. Cody ascends another drop in 150-Mile Canyon in Grand Canyon National Park. David free climbs out of the Redwall in 150-Mile Canyon. David rappels in Quartz Canyon in the Superstition Mountains. Tanner and Ron take in the narrows in Little LO Canyon in the Coconino National Forest. Laura rappels in Kolob Canyon in Zion National Park. David takes in Kolob Canyon. Brian slides in Kolob Canyon. David paddles while canoeing the Green River in Labyrinth Canyon. Camping along the Green River in Labyrinth Canyon. Brian rappels in Big Kahuna Canyon in the Mazatzal Mountains. Katie rappels a triple falls in Big Kahuna Canyon. Chris rappels in Big Kahuna Canyon. Cody exits Big Kahuna Canyon. Brian on the approach to South Fork of Alder Canyon in the Mazatzal Mountains. Cody on the approach to South Fork of Alder Canyon in the Mazatzal Mountains. Brian rappels the South Fork of Alder Canyon in the Mazatzal Mountains. 2012 was a very special year in the canyon lands. Crossing the Atlantic for our first international descents to a successful run at Poe Canyon may have been the highlights but there were many other equally special moments in between. Below is a collection of those moments in our favorite photos of the year. We hope you enjoy. Mike in Big Kahuna in the Mazatzal Wilderness Area, Ariz.
Charcoal on his face, David during the exit of Rock Creek Canyon in the Mazatzal Wilderness Area, Ariz.
Steve (front) in Waterslide Canyon in the Sierra Ancha Wilderness Area, Ariz.
John in Waterslide Canyon in the Sierra Ancha Wilderness Area, Ariz.
Eric (left) and Kyle bag a rope on a snow patch in Crack Addict Canyon in the Coconino National Forest, Ariz.
Mike on the approach to Poe Canyon in the Waterpocket Fold, Utah. Brian tossing a potshot over “Pit of Despair” in Poe Canyon in the Waterpocket Fold, Utah. Mike jumps over a pothole in Poe Canyon in the Waterpocket Fold, Utah. (From left) Brian, A.J., Eric and Mike at the end of Poe Canyon in the Waterpocket Fold, Utah. Halls Creek Narrows in the Waterpocket Fold, Utah. Gramps and Wyatt in front of their yurt at the Flagstaff Nordic Center. Cheryl in Illusions Canyon, Ariz.
Eric rappels in Illusions Canyon, Ariz.
Eric beach whales out of a pothole in Illusions Canyon, Ariz.
David in Val Bodengo, Itay. Pascal in Val Bodengo, Italy. Matilde and Guiseppe at the Sosta Pincée during a special dinner, Italy. Laura looks out from the fortified walls of castle Sasso Corbaro in Bellinzona, Switzerland. Religious shrine above Val di Gei, Ticino, Switzerland. Eric rappels in Val Grande, Ticino, Switzerland. Laura swims in Val Grande, Ticino, Switzerland. Eric alongside a small glacial lake on the hike to Pizzo Campo Tencia, Ticino, Switzerland. Laura rappels Pontirone Lesgiüna in Ticino, Switzerland. Eric jumps Pontirone Lesgiüna in Ticino, Switzerland. Eric in Pontirone Lesgiüna in Ticino, Switzerland. Flowers at the Botanical Gardens at Brissago Island, Switzerland. David swims Osogna Nala inferiore in Ticino, Switzerland. Laura, self portrait at the Curzútt Hostel, Ticino, Switzerland. Village of Lodrino, Ticino, Switzerland. Eric rappels, Lodrino inferiore, Ticino, Switzerland. Traditional song and dance at the Grape Festival in downtown Bellinzona, Switzerland. Flying over the Alps, Switzerland. Tanner approach Bailey Canyon, Angeles National Forest, Calif.
David rappels Garden Creek Canyon in Grand Canyon National Park, Ariz.
Mike in Garden Creek Canyon in Grand Canyon National Park, Ariz. Fallen leaves in Barney Spring Canyon in Coconino National Forest, Ariz.
Eric rappels in Barney Spring Canyon in Coconino National Forest, Ariz. Giant Saguaro Cactus at sunrise on approach to Robber’s Roost in Superstition Wilderness Area, Ariz. Giant Saguaro Cactus on approach to Robber’s Roost in Superstition Wilderness Area, Ariz.
Another year. This one was strikingly different from those before. As 2010 came to a close and 2011 began, our son Wyatt was just a month old. While this effected the number of canyons we got out to explore, particularly for Laura, it did not effect the quality of exploration ranging from pushing hard, physical and technical canyons in new territory to venturing into the canyonlands with Wyatt, along. We will see you in 2012! I may be a little late in posting this but give me a break, I have been busy. On 11/26/10, the day after Thanksgiving, Laura gave birth to our son, Wyatt Aaron Segall Wallace. This is not a baby blog so I’ll let you watch the show, but stay turned for an upcoming blog post on Wyatt’s first canyon exploration. Oh yeah, 2010 was an amazing year exploring the canyon lands. Several years ago I took a basic first aid class that lasted three hours at a public library. I figured with all of the time that I spend in the outdoors it would be good to have at least a little bit of training in first aid. As could be expected the class did not delve that deep and I did not leave feeling that I would be prepared to deal with the myriad of situations that could arise during the course of my adventuring in the wilds. On a recent canyoneering trip, my buddy, Clint, talked about how he was trying to organize a wilderness first aid class to be taught by the Wilderness Medicine Outfitters. In late September the class was held over three very hot day days at Roosevelt Lake. Our instructor, Marc McDonald, was excellent during the intense 24- hour course. Just some of the topics we covered were anatomy and physiology, patient assessments, bleeding control and bandaging, splinting, hypothermia, spinal immobilization, bites and stings, legal issues, extrication and what to have in your first aid kit. One of my favorite things about the class were the number of scenarios we enacted and dealt with as if they were real life situations. It was also great that all of the students in the class and our instructor, Marc, are all technical canyoneers, so much of the course was geared towards what we could face. I highly recommend this class, particularly to those of you are out there playing hard in some remote places. Check out Wilderness Medicine Outfitters’ website. Clint uses a “SAM Splint” to make a cervical collar on Mark’s neck. As if on cue, after learning about scorpion stings this bark scorpion showed up in the middle of class. Jedi style, Mark does a patient assessment on Tom with a blind fold on. Rappelling off the bridge over the Upper Salt River after the end of a long hot day of class. Rappelling off the bridge is illegal without permission from ADOT. Mark carries Eric on his back with a rope as an extrication technique as Clint looks on. 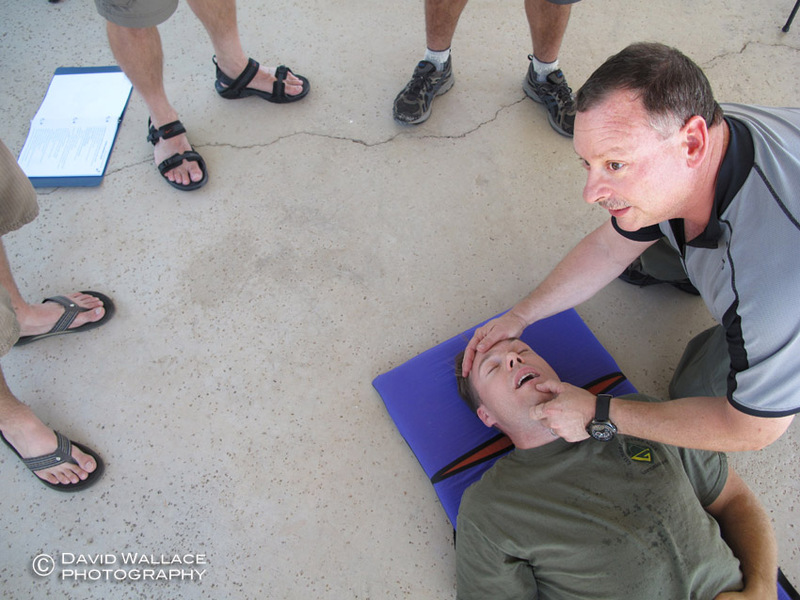 Wilderness Medicine Outfitters Instructor Marc McDonald demonstrates checking to make sure the airway is open on student, Mark O’Brien. On the weekend between two significant Utah canyoneering trips, we decided to leave the wetsuits at home, not fill the gas tanks all the way and head to nearby Pinnacle Peak Park for some climbing and canyon rescue practice. John, Eric and myself worked on haul systems and converting a static rappel block into a lowering system. These would be used for a person either stuck or injured on rappel or if not enough rope was deployed to reach the ground. After successfully working these systems on the ground we worked them with one of us actually on rappel off the ground. It was great practice and we squeezed in a few climbs as well, including a difficult 5.10 crack climb. Rescue practice (left) climbing (right). John, Eric and David work rescue skills off the ground.